Houston's Et Voilà Théâtre to perform "Comme S'il En Pleuvait"
"As a communications agency with an international presence, we are happy to celebrate Houston's cultural diversity and support its multicultural arts community through our involvement with Et Voilà Théâtre," says HexaGroup President Arnaud Dasprez. HexaGroup is proud to announce that Et Voilà Théâtre will be presenting its yearly production for Spring 2015 "Comme s'il en pleuvait" or "Out of control". 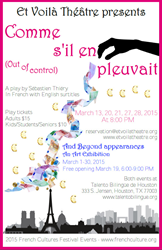 Performed in French with English surtitles, the play will open March 13th at 8 p.m. at Talento Bilingüe de Houston. Additional evening performances will take place March 20, 21, 27, and 28th at the same time and location. A proud sponsor, HexaGroup has been involved with the French-speaking troupe since 2009. "As a communications agency with an international presence, we are happy to celebrate Houston's cultural diversity and support its multicultural arts community through our involvement with Et Voilà Théâtre," says HexaGroup President Arnaud Dasprez. Written by Sébastien Thiéry and directed by Valerie Huguet, the play "Comme s'il en pleuvait" will feature Yves Cloots, Bruce Maskell, Ines Muñoz, and Laurence Sebeyran. The play follows struggling Bruno and Isabelle as they encounter unexpected wealth and the challenges that come along with it. Tickets are $15 for adults and $10 for kids, seniors, and students. Reservations can be made by email at reservation(at)etvoilatheatre(dot)org or through PayPal on the Et Voilà Théâtre website. Established in 1998 in the Houston French community, Et Voilà Théâtre is an amateur French-speaking troupe purposed to promote French language through theatrical expression. Each year, the company performs a play in French projecting English subtitles throughout to connect with non-French speaking communities. The nonprofit association has performed twenty plays in Houston and surrounding cities involving directors and actors of multiple nationalities who desire to speak the French language. We are an award-winning marketing communications agency, HubSpot partner, and Microsoft.NET practice that balances strategy consulting, marketing, content production and technology expertise. Our inbound marketing strengths, passion for technology, and out-of­the­box creativity drive captivating design and content, while our strong software and web development offerings reach new levels. Based in Houston, Texas, we also offer incomparable energy industry knowledge.